The ability to have immediate access to essential building materials on large-scale construction sites can make a significant difference to property developers. This can limit transportation costs, increase productivity and cost-savings through bulk purchasing of materials. Francis Ward has a range of bulk containers for both dry and wet materials (aggregates, cement, sand, etc). The DG range of silo IBCs is available in a wide range of capacities with three different cone angles 60°, 90° and 120° to cater for differing material flow properties. 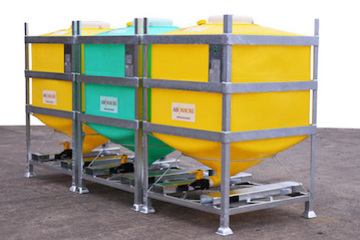 To view our range of IBCs for general purpose applications please click the link below.